When on safari in Africa, the vehicles used include Landcruisers, Land Rovers and Minibuses. These vehicles are manufactured by a number of well-known automotive corporations that include Nissan, Suzuki and Toyota. However, these are not the typical vehicles that soccer moms drive or weekend warriors use to enjoy four-wheeling out in the mud. The unique terrain and environment of the country require that vehicles used here have a few tweaks and modifications. 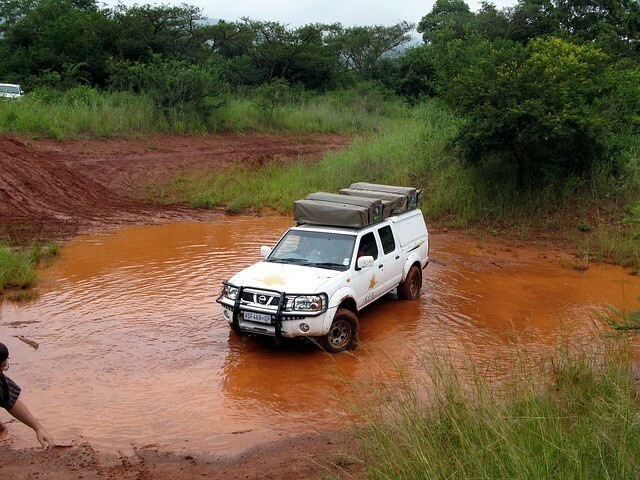 Most of the vehicles driven in Africa are factory adapted to accommodate the terrain and the purpose for being used. Conventional automotive sunroofs are typically tinted and crank open at an angle or slide open via a motorized system. On safari, pop-up sunroofs are quite common and merely consist of a portion of the metal roof elevating upward thanks to metallic framed extensions. As there are typically not enough windows for all to have a clear view, the modification enables occupants to stand and observe the wildlife filled location while still having the luxury of sun protection. Roof hatches are another option. Vehicles may have one or more of these adaptations. In this instance, the entire roof portion is removable for unencumbered viewing in forested areas. Most take the mechanical undercarriage components of vehicles for granted. However on safari, these modifications become necessary for safe travel and survival. Commonly equipped with 4WD, the suspension on these vehicles is heavy-duty for off-road conditions that may include climbing up and down mountains, in and out of volcanic craters or navigating along washed out roads. These adaptations are designed to ensure the durability of the vehicle and not necessarily the comfort of passengers. Suspensions and shock absorbing ability are part of normal body design on vehicles used for long distance travel or in more civilized locations. It is not uncommon for vehicles to have two fuel tanks, which hold 40 gallons (150 litres) of fuel or more, as refueling options are far and few between on the Serengeti Plain. Each vehicle also frequently has two spare tires and a heavy-duty jack. Flats are not uncommon whether caused by poor road conditions or the extremely large, sturdy and unforgiving acacia thorns. In most locations, the front of a touring vehicle features a strong steel frame known as a bullbar that protects the vehicle and occupants from danger in the event an impact might occur with a large, angry wild animal. Entertainment is provided by taking in the vast surroundings filled with flora, fauna and geographical features that most only see on TV or the big screen. Radios are used primarily for communication between vehicles or between a vehicle, the camp or base station and not for listening to the weekend Top 40. Many parks and tour providers have made the transition to mobile phones. For the safety of passengers, vehicles often have a combination of lap belts and three-point belts. There are no airbags. In most instances, changing the interior air climate requires opening a window. Customized paint colors include beige and green hues that aptly blend into the terrain and do not stop animals from approaching.